Meticulously manufacture, different for you. Packed in strong carton,suitable for long distance ocean transportation. We are the 3rd largest manufacturer of aluminum collapsible tube in China. Our company established in 1981 with nearly 40 years experience in aluminum soft tube manufacturing. Our company brought in several high speed automatic production line from Germany and Italy. We gather a professional management team, combine the tube making technology accumulated in 30 more years with scientific management, regard “make every aluminum soft tube trustworthy” as our quality concept to cover the whole process including products designing, developing, producing, transporting and servicing. 1. CAP: Colour-white/ red/ blue; Type-Conual Piercer; material- HPPE. 3. Internal Lacquer: Type- Expoxy- Phenolic Resin. 4. External Base Coat: Type- Enamel; Colour-White. 5. Colour Ink: Suplier-Shanghai DIC. 6. Crimp sealant brand: PPG. 7. Manufacturing Environment: The construction of 100000-ton cleaning production packing workshop. 8. 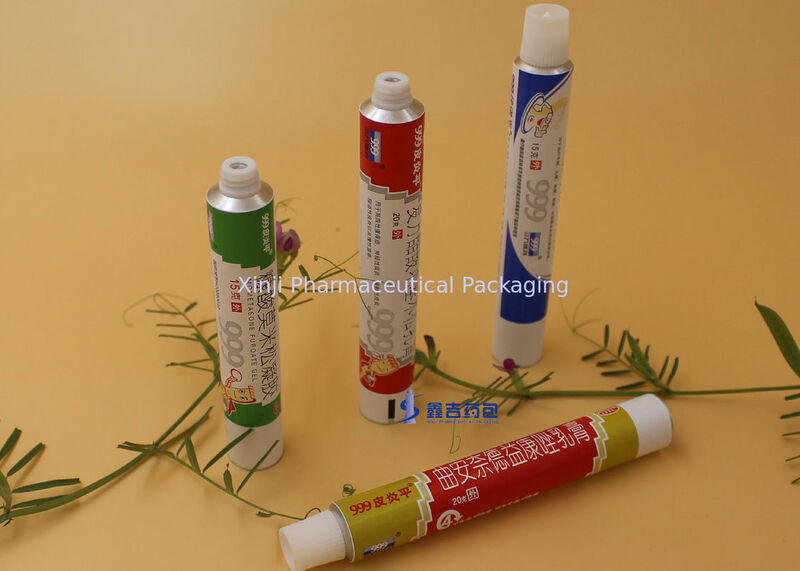 The standard of Inspection:BS2006-86 Aluminum collapsible tube for medicine ointment. 1. Are you trading company or manufacturer ? We are the 3rd largest manufacturer in this industry. 2. How to get samples ? Samples without customized printing are free, but do not pay the cost of freight. 3. How long is your delivery time? Generally it is 30 days after we sign the contract, it is according to quantity. 4. What's your payment term? T/T, L/C, Western Union, etc. equipped with technique of the mark one take on top sealed and tube shoulder, three take on internal coating, six colors printing and the latex at the end, etc which can meet requirements of kinds tube appearance for customers. Business philosophy: Meticulously manufacture, different for you. China Good Quality Aluminum Packaging Tubes Supplier. Copyright © 2017 - 2019 aluminumpackagingtubes.com. All Rights Reserved.